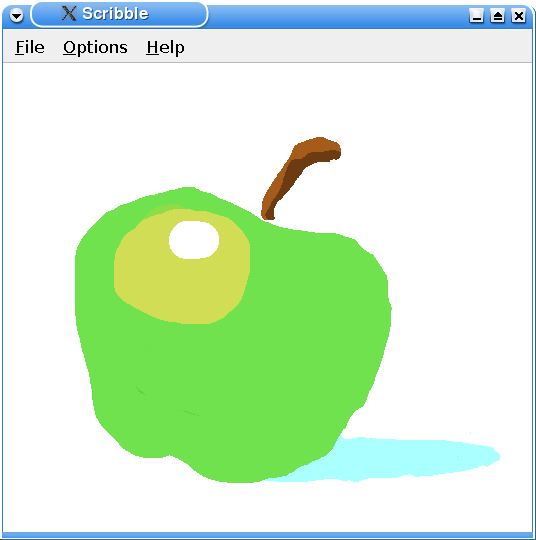 With the Scribble application the users can draw an image. The File menu gives the users the possibility to open and edit an existing image file, save an image and exit the application. While drawing, the Options menu allows the users to to choose the pen color and pen width, as well as clear the screen. In addition the Help menu provides the users with information about the Scribble example in particular, and about Qt in general. We will start by reviewing the ScribbleArea class, which contains the interesting, then we will take a look at the MainWindow class that uses it. To retrieve a new pen width in the penWidth() slot, we use QInputDialog. The QInputDialog class provides a simple convenience dialog to get a single value from the user. We use the static QInputDialog::getInteger() function, which combines a QLabel and a QSpinBox. The QSpinBox is initialized with the scribble area's pen width, allows a range from 1 to 50, a step of 1 (meaning that the up and down arrow increment or decrement the value by 1). In the createAction() function we create the actions representing the menu entries and connect them to the appropiate slots. In particular we create the actions found in the Save As sub-menu. We use QImageWriter::supportedImageFormats() to get a list of the supported formats (as a QList<QByteArray>).